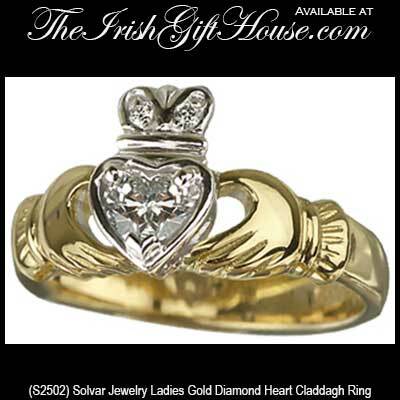 This Claddagh shadow band has been hallmarked 18K gold by the Irish Assay Office at Dublin Castle in Ireland. This diamond Claddagh engagement ring shadow band is in 18K yellow gold and features three diamonds for a 0.02 carat weight. The diamond clarity grade is SI 1 and the diamond color is G- H. The 1/8" tall Claddagh shadow band is made by Solvar in Dublin, Ireland. The available matching, S2502, 18K gold diamond Claddagh engagement ring fits into this shadow band and is sold separately. 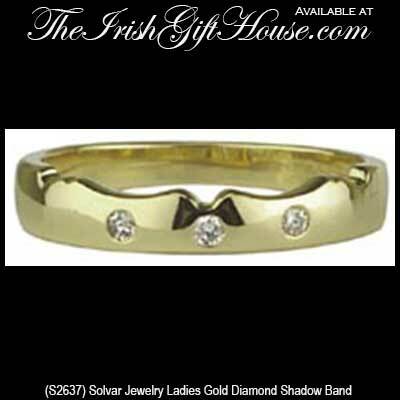 This diamond shadow band for a Claddagh engagement ring is available in sizes 5 through 9, including half sizes.